You’re looking for a chromebook with pen input? 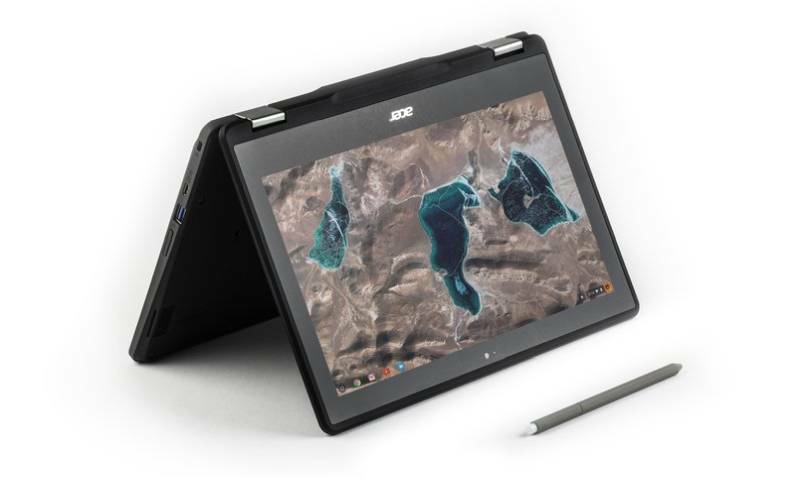 During an education tradeshow Acer introduced the Acer Chromebook Spin 11 which basically is the Chrome OS version of the TravelMate Spin B1 that runs Windows 10. Like its sibling the Chromebook Spin 11 is a small notebook featuring a 360 degree rotating touchscreen that can be used with a stylus for inking. Convertibles like these with Chrome OS are very interesting since you’ll be able to run Android apps from the Google Play Store on them. According to Acers press release the Chromebook Spin 11 R751T is perfect for students, it’s aimed at the education market. That’s why it features a robust housing with the MIL-STD 810G standard. You can use it like a normal notebook but can transform it into a tablet by rotating the screen. Once rotated you’ll be able to use a 5 megapixel camera that’s placed above the keyboard – so the camera works like the ones of normal tablets. The stylus is said to be quite cheap and easy replaceable. It’s a pen with Wacoms EMR (Electro-Magnetic Resonance) technology which means you won’t have to charge nor pair it. On the back of the stylus is an eraser. Pen input including handwriting recognition is supported in Chrome OS now. The display of the Chromebook Spin 11 is 11.6 inches and has a resolution of 1366 x 768. Inside runs an Intel Celeron N3350 dual core or Intel Celeron N3450 quad core processor. Depending on the version you’ll be able to get 4GB to 8GB of memory and an internal storage of 32GB or 64GB. The battery is expected to last up to 10 hours. Even though it’s a chromebook you get quite some ports on the side of the device including two USB Typ C ports. There are also two normal size USB 3.0 ports and a card slot for micro sd cards. The Acer Chromebook Spin 11 should be available this spring but there’s no pricing yet. Judging from the lower class hardware it shouldn’t get too expensive though.